The Department of Biochemistry at the Indian Institute of Science, Bangalore started in 1921. It has remained in the forefront of biochemical research in the country. It has deservedly received recognition at various stages of its growth. The department was recognized as a Centre of Advanced study in Biochemistry in 1968 by the University Grants Commission. This Department has continuously provided the nucleus that has led to the establishment of new centres of focused research within the Institute, and also research institutions elsewhere such as the Lac Research Institute (Ranchi), Central Food Technological Research Institute (Mysore) and ASTRA Research Centre (Bangalore). The faculty members have set high standards in their research work. Their investigations have always remained close to the problems of the country, yet they have kept up with the fast-changing developments in biochemistry. Their projects continue to attract funds from several Indian and foreign agencies whose support has significantly enhanced the research output. These include UGC, CSIR, ICMR, ICAR, DAE, DST, DBT, Ford foundation, WHO and ASTRA ( Sweden), Welcome Trust. The achievements of the faculty members have been recognized by a number of awards that include Bhatnagar (CSIR), Watamull (USA), Sarma Memorial (SBC), Sreenivasaya Memorial (SBC), P.B. Rama Rao Memorial (SBC), Hari Om Ashram (UGC), J.C. Bose (UGC), Sanjay Gandhi, O.P. Bhasin, FICCI and Ranbaxy awards. Fellowships have been conferred on faculty by learning bodies like Indian National Science Academy, Indian Academy of Sciences and other professional societies. The faculty has played a key role in forming the Socitey of Biological Chemistry (India) and Guha Research Conference, and also in starting the scientific journals viz. Current science and the Indian Journal of Biochemistry. The varied experience and expertise of the faculty members have been extensively used in a number of scientific advisory committees and also in the editorial work of several scientific journals. The quality and breadth of research in the Department has attracted bright students from the universities and scientists from other institutions. The credit for experimental work in the research programmes of the Department goes to them in good measure. The number of students in the department has increased since 1959 when the Institute started giving its own degrees. 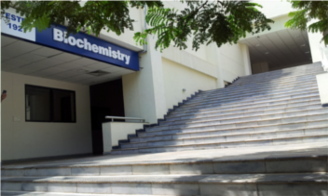 Many of the alumni have occupied responsible positions in India and abroad and have won acclaim for their contributions to the advancement of biochemistry. In the Department the students participate in running a Biochemical society. Periodically training programmes are offered in the form of workshops in special techniques, summer schools in specific topics and short term research projects. Through consultancy projects the faculty members have responded to the needs of the industry. In some cases they have actively supported the formative stages of some industrial units. Over 75 years, the department has grown in size and facilities to suit the changing trends. To achieve its goals, the department has received continuous support from UGC, COSIST and from a number of sponsored projects. With the support of DBT, infrastructural facilities for automated Protein and DNA sequencing have been acquired. A modern animal house with provision for primate work and a nursery for plants have also facilitated work on many projects. The support staff has been the backbone in maintaining the laboratories and the facilities.